The participant of last year's TechHR Startup Program, Leena AI will now be backed by one of the leading investors of the United States. Read on to know who. Leena AI, the HR Tech startup founded in 2015 will now be backed by the American seed accelerator, Y Combinator. As per a report, Leena AI has confirmed an investment from Y Combinator and has also become a part of their summer class 2018. “We at Leena.AI welcome Y Combinator to be a part of the journey in making a truly intelligent virtual assistant for the workplace,” co-founder Adit Jain wrote in a Facebook post. As Adit and team look forward to doubling their market leadership in India & APAC, the partnership with Y Combinator will help the AI bound HR Tech startup in refining its pitch. The U.S based investor will basically help the team in making introductions to companies that could make use of this tool. 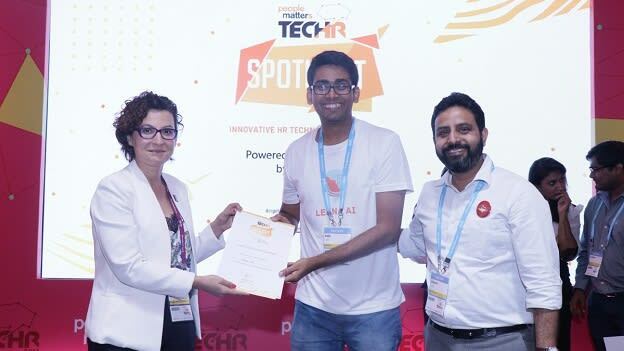 Founded by Adit Jain, Mayank Goyal and Anand Prajapati, Leena AI is an AI-powered HR Assistant providing instant responses to employee queries and improving the employee experience. Currently, the startup has 12 paying clients including Coca-Cola Vietnam, Pearson, Marico, RPG among others on board. Now it aims to further expand and double this number in the next 60 days. Leena AI has its roots in another startup called Chatteron, which the founders started after they got out of college in India in 2015. Now, with the latest product offering the team is enabling the employees to get instant answers for their work-related queries in an automated fashion. The bot Leena AI can be integrated into Slack, Skype or Workplace by Facebook. Also, they are built and trained using information in policy documents and by pulling data from various back-end systems like Oracle and SAP. Now, with the aim of closing FY18 with 5x revenue, Leena AI would also be looking to do experiments in other verticals like IT, Admin, Finance, Procurement, Sales and MIS.